State law (M.S. 84.8712) regarding the use of metal traction devices (a.k.a. 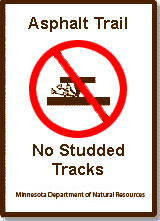 "studs") on paved public trails reads: "A person may not use a snowmobile with metal traction devices on a paved public trail that is designated closed to such use by a local government with jurisdiction over the trail or on a paved state trail or any portion of a paved state trail that is designated closed to such use by the commissioner". Learn more about the law. The table and the map on this page lists all developed State Trails, and provides information on allowed snowmobile uses. Please note that paved trails administered by local units of government are also subject to the metal traction device prohibition law. Check with the local trail administrator for use restrictions. For more detailed information refer to a snowmobile map of the area you plan to ride or call the DNR Information Center for the most up-to-date trail information at 1-888-MINNDNR (1-888-646-6367). Entire length of trail open to snowmobiles. Entire length of trail not open to snowmobiles. Open, not groomed in winter. Parallel trail is groomed for snowmobiles. All snowmobiles must run on parallel trails. No snowmobiling is allowed on paved surfaces. North segment, from Red Wing to Hay Creek, all snowmobiles must run on parallel trail. South segment, from Zumbrota heading north for 4.5 miles, snowmobiles with or without studs are allowed. Parallel trail adjacent to paved trail from County Road 9 to Elgin (8 miles). Northern 5 miles of developed trail from Elgin to Plainview has a grant-in-aid trail that closely parallels paved trail. No parallel trail available, except for a very short segment between Lanesboro and Whalan. Because the Root River Trail is predominately a non-motorized trail, snowmobiles are not allowed on the paved surface of the trail.